The hybrid system will start by pressing the Engine Start/Stop button, only when the smart key is in the vehicle. Even when the smart key is in the vehicle, and when it is far away from the driver, the hybrid system may not start. When the Engine Start/Stop button is in the ACC or ON position, any door is open, the system checks for the smart key. When the smart key is not in the vehicle, the " " indicator will blink and the warning "Key not in vehicle" will come on. When all doors are closed, the chime will also sound for about 5 seconds. Keep the smart key in the vehicle when in the ACC position or if the hybrid system is ON. 1. Always carry the smart key with you. 2. Make sure the parking brake is applied. 3. Make sure the shift lever is in P (Park). 5. Press the Engine Start/Stop button. If the hybrid system starts, the " " indicator will come on. 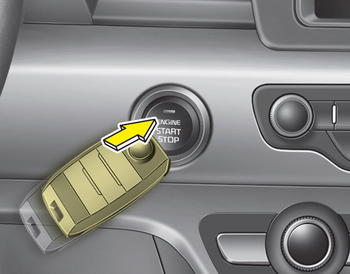 If the " " indicator turns off while you are in motion, do not attempt to move the shift lever to the P (Park) position. If traffic and road conditions permit, you may put the shift lever in the N (Neutral) position while the vehicle is still moving and press the Engine Start/Stop button in an attempt to restart the hybrid system. The side with the lock button should be contacted directly. When you press the engine start/stop button directly with the smart key, the smart key should contact the button at a right angle.